Logitech Screen Share brings fast and easy content sharing to any conference room computer. 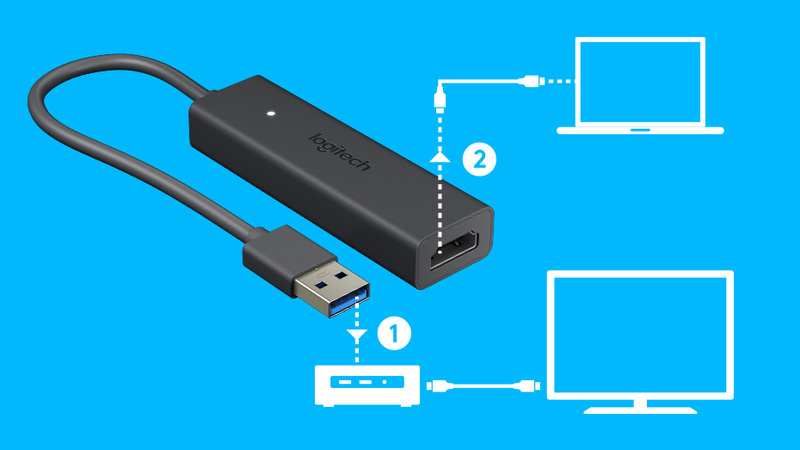 Simply connect a laptop or tablet via HDMI to start sharing: theres no need to install software, enter a passcode, or even connect to the internet. Affordably priced for every room, Logitech Screen Share takes the hassle out of presenting slides, spreadsheets, documents, and video recordings into online meetings. Logitech Screen Share brings fast and easy content sharing to any conference room computer. Simply connect a laptop or tablet via HDMI to start sharing: there’s no need to install software, enter a passcode, or even connect to the internet. 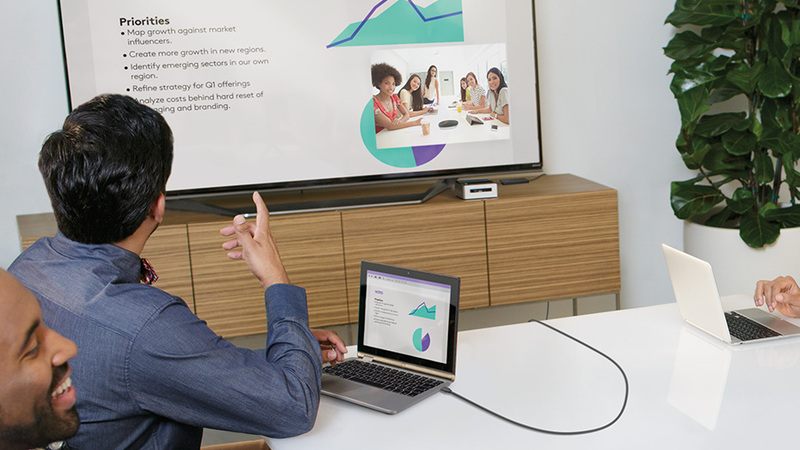 Affordably priced for every room, Logitech Screen Share takes the hassle out of presenting slides, spreadsheets, documents, and video recordings into online meetings. Just plug in. Isn’t that how content sharing is supposed to work? No more checking and rechecking the meeting ID or pairing code. And no more fumbling with input sources and remote controls. There’s nothing to learn, no software to install, and you don’t even need to be online. Simply connect and present. Don’t leave remote colleagues at the dark end of a conference call. 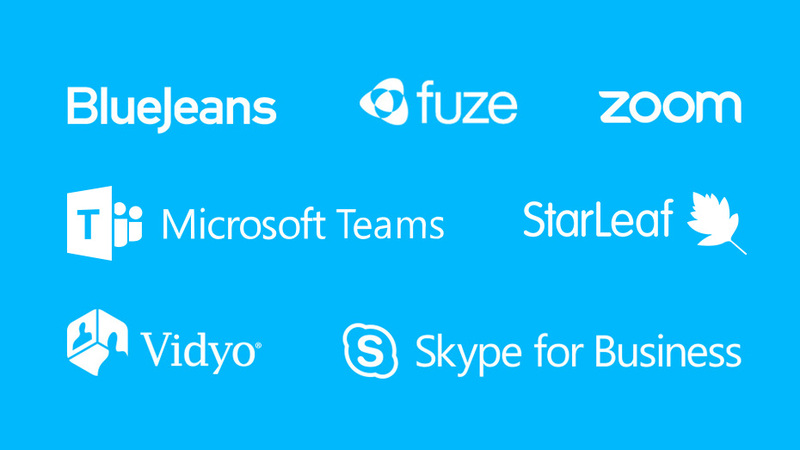 Logitech Screen Share works with Zoom, Skype for Business, WebEx, BlueJeans, and other meeting services that support content sharing. 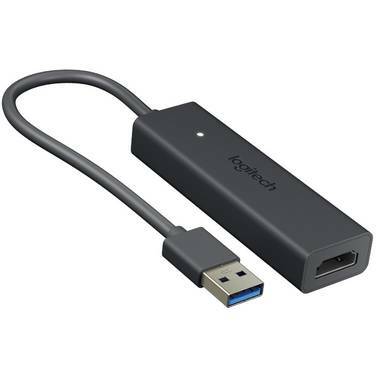 Packed with video encoding technology and yet surprisingly compact, the Screen Share Device (1) connects to the conference room computer via USB, and (2) provides an HDMI input for instant content sharing. Stop crowding around a laptop! Just connect to Logitech Screen Share to project your presentations, spreadsheets, documents, and videos on the in-room display. 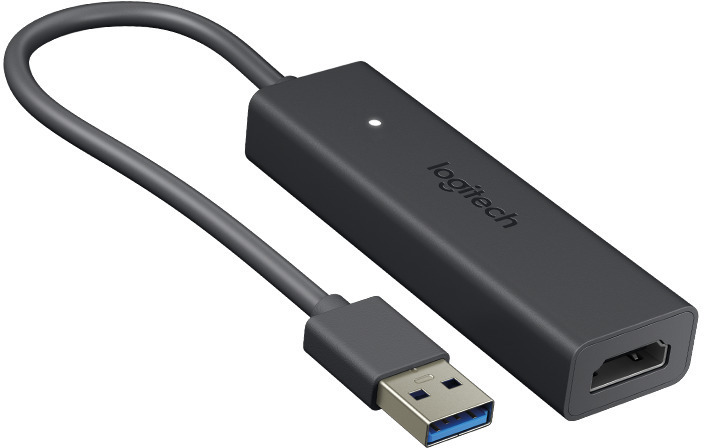 For devices without a built-in HDMI port, simply connect a suitable adapter. This lets you share from any device with a video output, including smartphones, tablets, ultrabooks, digital cameras, and media players. Share a preview of your latest video project. Get feedback on work-in-progress. Showcase your portfolio from YouTube and Vimeo. With support for HD video and audio over HDMI, Logitech Screen Share lets you present videos as they were meant to be seen and heard. Jumpy cursors and jittery screens frustrate participants and disrupt meetings. With its ultra low-latency HDMI connection and on-board video processing, Logitech Screen Share delivers a sharp and responsive experience in every meeting. This means natural-feeling navigation, instant typing, smooth scrolling, and 1080p HD video at up to 30 frames per second. The Screen Share Application runs on the in-room computer for easy sharing into online meetings. Meanwhile, the in-room video and audio remain active, so presenters can share content -- even videos with sound -- and be seen and heard at the same time. Add wired content sharing to rooms equipped with Zoom Room systems and other PC- and Mac-based conference room solutions to instantly share your screen into any online meeting. 1 Additional configuration may be required.